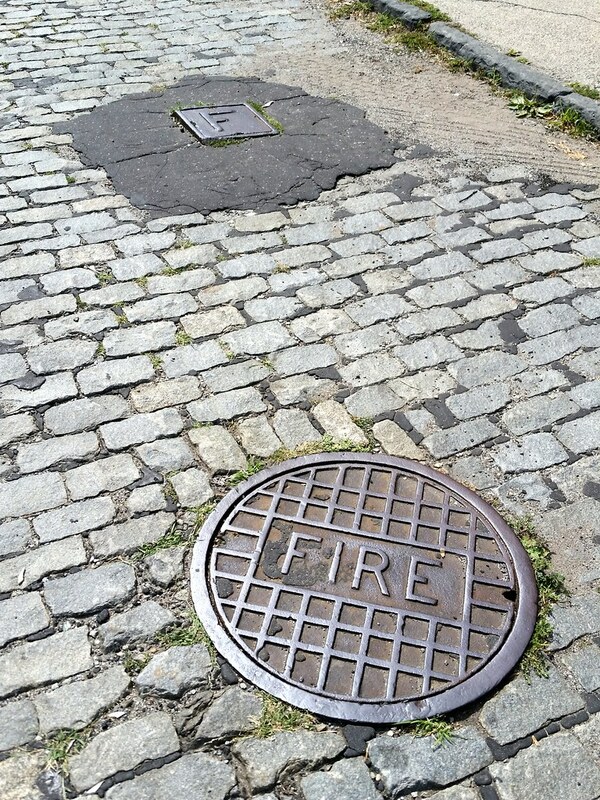 I'd never seen a manhole cover labeled "FIRE" before, but there are at least three in the immediate vicinity of the former Lidgerwood factory in Red Hook. As this 1916 map shows (look for the 12-inch high pressure line on Dikeman Street between Ferris Street and the water), the manholes are remnants of an old network of high-pressure water mains and hydrants installed in the early 1900s to improve firefighting capabilities in and around Downtown Brooklyn. Similar systems were also built in Coney Island and Manhattan. Pumper trucks eventually eliminated the need for the high-pressure hydrants, which spent their last couple of decades operating like standard hydrants before being taken out of service altogether around 1980. Even though they were just useless relics from that point on, the city continued issuing tickets to vehicles parked in front of them. Day 1056: Heavens to Murgatroyd!